From helping victims of the California wildfires to granting the wishes of critically ill children, eBay’s revamped Gifts That Give Back (GTGB) program provides over 54,000 charities the tools to create symbolic gift listings. These gifts may be purchased by millions of generous donors who wish to support their favorite non-profit organizations and the causes they stand for. eBay ensures that every symbolic gift sees 100% of the proceeds go directly to the sponsoring charity. Charities such as St Jude Children's Research Hospital can now create gift listings and raise funds to purchase books, art supplies, physical therapy, and so much more! Originally piloted in late 2016 by eBay for Charity, the GTGB pilot faced several challenges. Notably, charities were unable to create gift listings on their own. Rather, each participant in the GTGB program was required to work directly with the eBay for Charity team to design, create, and manage their gifts; a process which could take up to several weeks. This changed in early 2018 when Ethan Rubinson, a Software Engineer at eBay, secured funding through eBay’s Innovation Programs to revamp the GTGB program enabling it to scale for the global market. Ethan, with the support of Marci Ross, Scott McDowell, and the entire eBay for Charity team, successfully launched the revamped program early this year. The revamped GTGB program features a new gift creation experience for charities, allowing them to create gift listings in just a few minutes. Using the GTGB Gift Creator, charities who are currently registered as Direct Sellers on the eBay platform need only specify what the gift is for, its price, how many are available, and a short description of how raised funds will benefit the cause. Then, after uploading a picture, charities can submit their gifts and immediately start sharing their new gift with their donors. Not only can charities share their gifts with their current donor base, but every gift is also discoverable by each of eBay’s 177m active buyers. With the new GTGB program, charities can also choose to automate the delivery of tax receipts and donation certificates to individuals who purchase one of their symbolic gifts. The vision behind the new Gifts that Give Back program is to allow every charity registered on eBay to create unique and personalized listings to help fundraise for a cause. 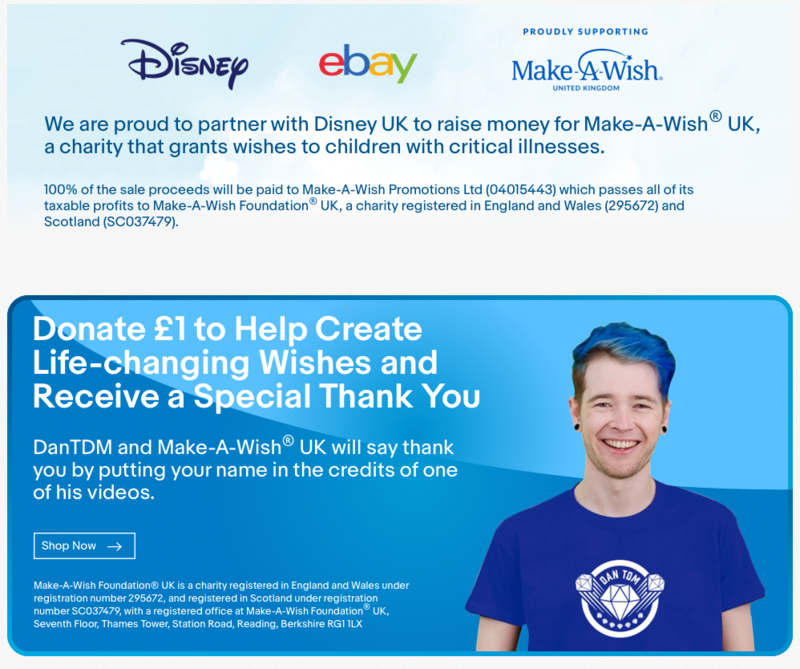 An example we’re extremely proud of, is a recent campaign by Make-A-Wish UK, in partnership with Disney and DanTDM. The campaign used the flexibility of GTGB to create an innovative way to raise additional funds through a virtual gift concept. The campaign team created a £1 listing, with the proceeds benefiting Make-A-Wish UK and the buyer of the listing being entitled to receive video credit in one of DanTDM’s video. In less than a week, over 1,400 donations were made and the resulting credits can be viewed on DanTDM’s YouTube video. Help fill the world with color by purchasing a gift that gives back today!